The 1980s were a transitional time for American concepts of urban and suburban life, particularly from the perspective of the middle class. In his book Brat Pack America: A Love Letter to ’80s Teen Movies, Kevin Smokler explores both the real and fictional backdrops of now-classic 1980s films targeted to young audiences. In a recent live interview with Roman Mars about his book at SPUR in Oakland (excerpted in sections below), Smokler discussed what these movies meant to viewers at the time and what they continue to mean to fans today. They also talked about how the portrayal of real and fictional places in these films reflected changing perceptions of suburban and downtown living. Below, trailers and clips from key 1980s films are followed by an array of playable audio excerpts from the aforementioned live show. This is a unique hybrid 99pi production of video, audio and text, so sit back, relax, click and enjoy the show. John Hughes movies were critical in shaping pop culture through the 80s, both forming and reflecting teen experiences of the decade — or at least, the experience of white teens of Middle America. 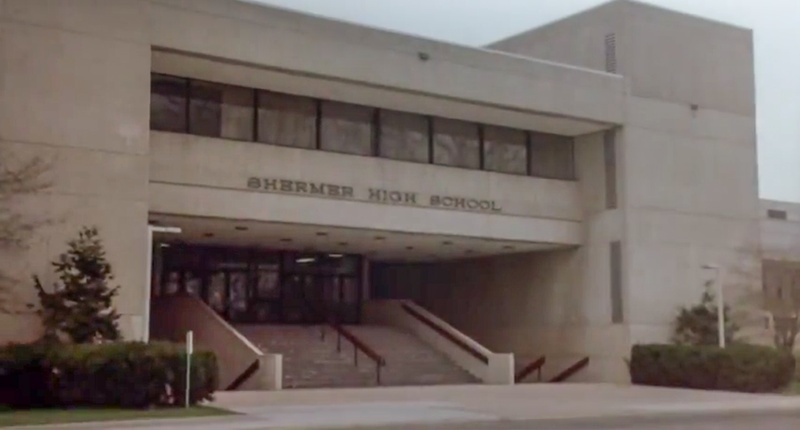 Classic 80s films including Sixteen Candles, The Breakfast Club, and Ferris Bueller’s Day Off owe a great deal to the built environments in which they are set — especially the fictional town of Shermer, Illinois. This imaginary town is nowhere but everywhere. It is a stand-in for a typical Midwestern town for ordinary middle-class families. On the one hand, Shermer is boring and safe — a place from which ones escapes to the dangerous and exciting city. On the other hand, it is home — a place to which one returns when the sun starts to set on the gritty street downtown. Shermer High School is the setting where the Breakfast Club forms, bonding a set of disparate students all sentenced to detention. Shermer is also home to Ferris Bueller and shows up in other films, too. And John Hughes knew it inside and out — though a product of the imagination, Shermer resonated with viewers who could relate to it. Sherwood, Ohio (not to be confused with Shermer, Illinois) is the setting of Heathers, a 1988 film written by Daniel Waters and directed by Michael Lehmann. The movie was promoted as a satire of a John Hughes movie and it is a seriously dark film by comparison. One might expect such a satire to feature a landscape of urban decay — something clearly opposite of a John Hughes-style suburb. Instead it is a kind of nowheresville — there are almost no clues to its location in the film. If Shermer is a mixed bag (idyllic for some, boring for others) Sherwood is certainly less romantic, a place no one would want to live. But on the spectrum of ideal and dystopian, even this horrible place can’t hold a candle to New Grenada, the setting of Over The Edge. Foster City is a real community that was built on reclaimed marshlands near San Francisco in the 1960s. It was designed in part for families with small children, a safe space of respite from the city — it was also the inspiration for New Grenada in Over The Edge. In the early 1970s, a report titled “Mousepacks: Kids on a Crime Spree” was published, pointing out something no one expected: this idyllic planned community had an exceptionally high rate of children committing crimes. Basically, bored and aimless kids were engaging in petty criminal activity. In real life, there was a meeting of city officials and parents and some of the kids showed up to share their point of view. The whole thing was pretty mellow and not terribly dramatic. The movie inspired by these real events, however, took things to creative extremes. It was set in fictional New Grenada (inspired by Foster City). Instead of having their say, though, the children lock the adults in the school during the meeting and wreak havoc on the parking lot, smashing and blowing up cars. If the kids in John Hughes movies were a bit rebellious, and a few sociopaths had their way in Heathers, well: the ones in this film truly went over the edge, becoming a mob of raging anarchists facing off against society. Inspired by Over the Edge, Kurt Cobain filmed his famous video for Smells Like Teen Spirit in the early 1990s. This music video added perhaps the final nail in the coffin of the John Hughes era of teen pop culture. Suddenly the alternative kids began taking center stage and rebellion was celebrated. What had been fringe was now cool, setting the scene for the new decade of alternative culture. 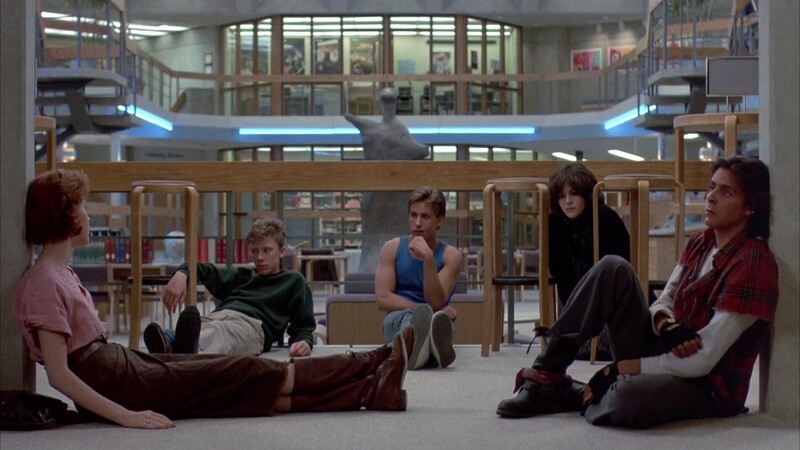 From depictions of bored but well-intentioned teens to scenes of dangerously rebellious youths, 1980s films say as much about American concepts of place as they do about people or culture. And their staying power is arguably anchored, at least in part, to these places. Even the fictional town of Shermer, Illinois has physical locations fans can visit — real buildings that can be seen and touched. And though Shermer High School is now a police station, visitors will still find fans taking selfies out front, collapsing the time and distance between their present reality and childhood memories in the process. 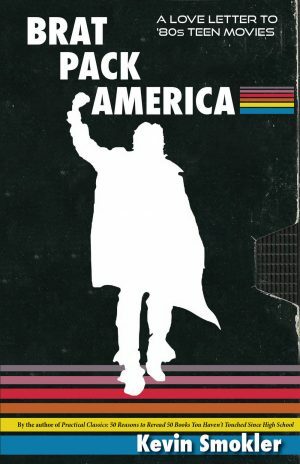 Producer Sam Greenspan organized and recorded the live interview between Roman Mars and Kevin Smokler, author of Brat Pack America: A Love Letter to ’80s Teen Movies, at SPUR (San Francisco Bay Area Planning and Urban Research Association) in beautiful downtown Oakland, California. Kurt Kohlstedt assembled clips for this hybrid production. Is there a way to get a full version of this interview? I loved the clips, but want more! This is pretty close to the entire conversation – just a few cuts here and there! Roman, thanks for ALL you do. This was one of your best productions. My wife and had our second date watching Ferris Bueller. I grew up in North Little Rock Arkansas and played on The Old Mill, which is is last shot in the opening title sequence of Gone with the Wind. Place matters.